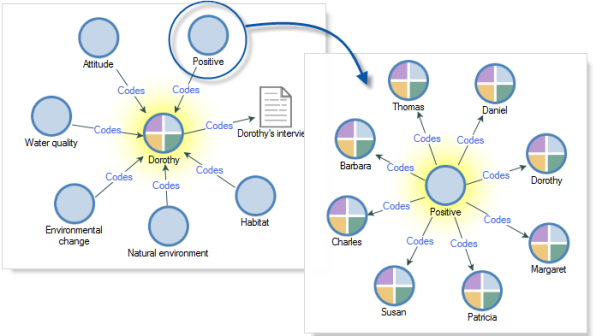 In NVivo, cases represent the 'units of analysis' in your research study—for example, the people you interviewed or the communities you studied. Your project might have cases for people, places, organizations, events or other entities that you want to analyze and compare. Cases are like containers that hold all the information related to a person, place or other unit of analysis. You can open a case to see all the information that has been coded there—for example, you could review everything that Mary said or everything about Harkers Island. When you begin a project, it is a good idea to decide on your units of analysis and plan for the cases you will need to represent them. When collecting data, record the descriptive information to support the comparisons you want to make. For example, asking whether young people see issues differently from older people requires that you record the age of your participants. 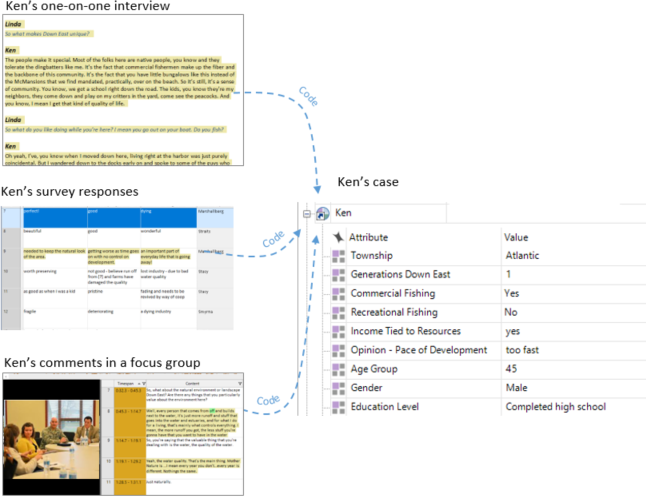 You can store these attributes directly in NVivo or in a separate file (text file or spreadsheet) and import it later. Not all projects require cases. Whether you need to set up cases depends on your research question and methodology. If you want to make comparisons based on the attributes of people, places, organizations or other 'units of analysis' then cases provide a useful way to do this. But if your project does not require these types of comparisons, then there is no need to create cases. For example, you may not need cases if you are doing a literature review or conducting in-depth interviews with only a few stakeholders. After creating cases, assigning attribute values and coding content at themes—you can use queries to make comparisons or gather the data in revealing ways. Review what participants over the age of forty said about water quality. Check for the dominant themes across different age groups and genders. See all participants by community or age. Gather all the material by female participants and create a new node based on the results. Then run a Word Frequency query on this new node to check for commonly used terms. Do the same for the male participants and compare your findings. After you setup cases and code your content at themes, you can use visualizations to look for commonalities, patterns or trends. Compare the coding for two cases using a Comparison Diagram. This is a useful way to check for similarities and differences between cases. In this example, the cases Helen and Paul both have coding at the nodes Jobs and Economy. 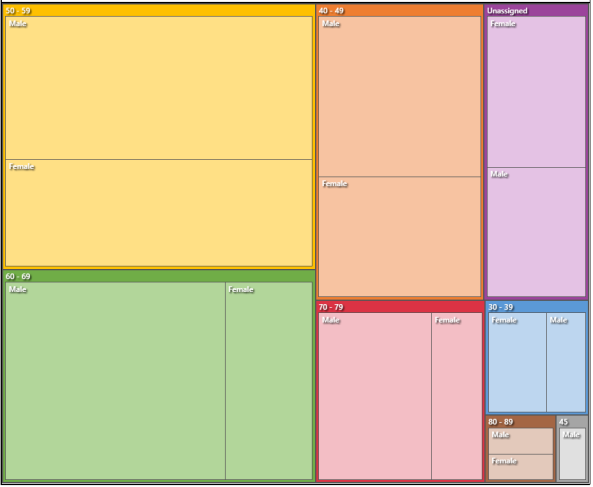 Check the demographic spread of cases in a Hierarchy chart. For example, you may want to check the representation of male and females in different age groups. 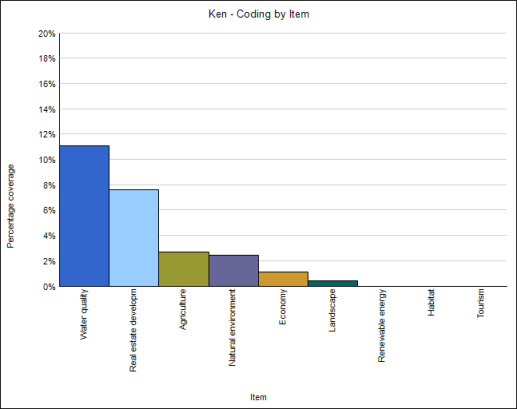 Use a chart to explore the coding for a case. This gives you a feel for the dominant themes reported by a case. Use a chart to explore cases that have coding at a selected theme. 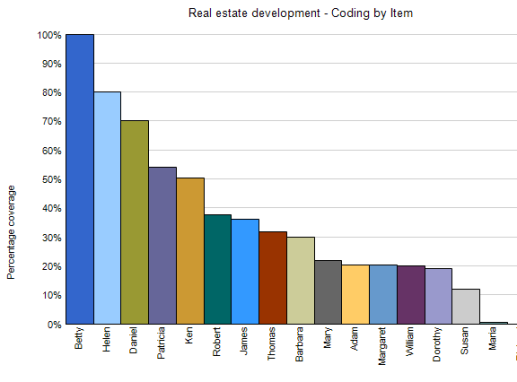 This example shows the cases that have coding at the node Real Estate Development. It also shows the percentage of each case that is coded at the node. It can be a useful way to see which cases mention a theme most often. 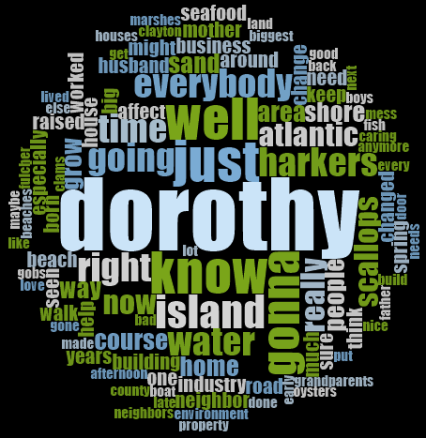 See the most frequently used words for a case in a Word Cloud. You can organize cases in hierarchies (parents and children) in ways that make sense for your project. If there is no logical connection between your cases (or perhaps these connections are not yet apparent) you can just add cases at the top level of the hierarchy. You can right-click on a parent and choose to aggregate coding from all the children. When you open the parent case, you will see content coded at all the child cases. This is useful when you want to review or query the content for a broad grouping—for example, run a Word Frequency query on Down East Communities. Framework matrices provide a way to summarize or condense your files in a grid that has rows for cases (for example, people you interviewed) and columns for theme nodes. 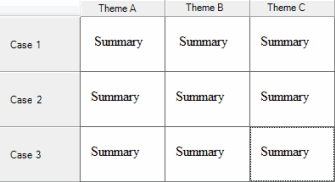 Each cell in the grid represents the intersection of a case and theme—when you enter text into the cell you can create a summary of the content relevant to that case and theme.